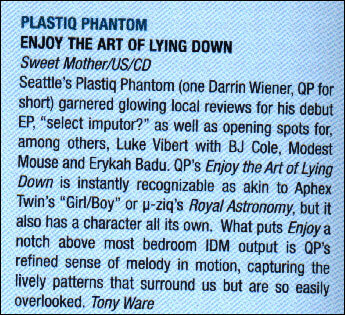 Seattle's Plastiq Phantom (one Darrin Wiener, QP for short) garnered glowing local reviews for his debut EP, "select imputor?" as well as opening spots for, among others, Luke Vibert with BJ Cole, Modest Mouse and Erykah Badu. QP's Enjoy the Art of Lying Down is instantly recognizable as akin to Aphex Twin's "Girl/Boy" or �-ziq's Royal Astronomy, but it also has a character all its own. What puts Enjoy a notch above most bedroom IDM output is QP's refined sense of melody in motion, capturing the lively patterns that surround us but are so easily overlooked.